I am a bag-a-holic. Not only am I addicted to knitting and yarn, but I am addicted to finding the "right" think to keep my knitting in... I have LOTS of bags - but can't have too many. Recently, I discovered military surplus (as if it's a new thing!) and found an online place that sells the name patches for uniforms, etc. I ordered a bag and a name badge... they arrived, and I had the patch put on the front of the bag. it's a super cool bag (of course, I can't remember the website now!) but doing a simple search online will give you a number of them to choose from! so this is my current favorite knitting bag - the straps on the front of the flap are velcro (ick) and go around brass hoops attached to the base of the bag to hold it shut - the rest of the closures are either snaps or zippers - perfect for a knitting bag! 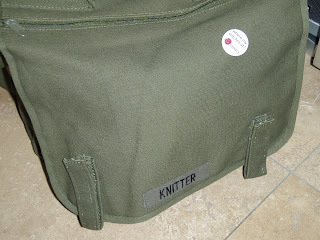 What do you use to transport your knitting? anyone else have fun ideas for carrying or storing your projects? As far as storing projects in progress, I usually have each different project in its own bag - ready to haul out - and I just stuff all the bags *somewhere* in my closet - it's not a perfect arrangement; but it works. Awesome! I know what you mean about "bleh" for velcro. Just a nightmare waiting to happen. I use a backpack I got at AC Moores for $10. Its a knock off of a Vera Bradley print. Has one big section for my WIP and notebook, and a small zippered section for DPN's and cable needles (not that I know how to use them yet). My mom and I both are bagaholics as well :) I think it goes hand in hand with knitting. Hey, Kyle, I can't even begin to tell you about my bag collection. I've got so many, and always on the look out for more. My Amazon wishlist is mostly bags. And I know all about the surplus store. (I can recite many of the item numbers from their supplier's catalogs!) And I not only knit, I've also got an obsession about CAMERA bags, too! Oh, I am a first-class bag-a-holic too! I don't even KNOW how many bags I have. There are all of the purses/handbags, of course, but I've amassed quite a collection of knitting/tote bags too. Geeky bits first: two of my favorite knitting bags are actually more or less just plain ol' canvas bags, which aren't the best knitting totes, really, but I like the designs on them. One is a conference freebie advertising the Shorter Oxford English Dictionary (yeah, yeah, I know -- but I *love* dictionaries, so this bag is geeky enough for me even though it's nothing special as far as bags go), and the other is my official NPR-sanctioned Nina Totin' Bag. ;-) I also have a couple of Lexie Barnes bags for when I'm feeling stylish, and a couple of handmade quilted bags for when I'm feeling homespun, and a couple of repurposed laptop bags so I can look somewhat professional when toting the knitting to conferences and the like. And I have all kinds of little project pouches, too -- small little things that are just big enough for a sock or sleeve in progress. My favorites are silk ones from Della Q.
Oh my gosh, I'm such a bag-a-holic myself. I have like 8 knitting bags and I can't decide which one is better. The one that I'm using right now is by Namaste, the reason I like it is because it has lots of pockets an NO VELCRO!!!! The only thing that I don't like about it is the magnetic claps that close the bag. it's hard to find the clasps and make them close. But anywho. BRILLIANT idea to have a bag for each WIP. What a great excuse to make sure I have plenty! I only have two right now. 1 Big one to hold everything and it's functional but too big to haul around really and one small project bag. I am in San Diego for a couple of days for my husband's business and I plan on going to a shop close by that has Namaste bags. I can't wait to browse! I have lots of bags (Timbuk2, GoKnit Pouches, numerous canvas totes, and even a recycled banner tote) but I don't LOVE any of them. I'm still on the hunt, but just ordered a Tom Bihn Swift bag, so I hope that's the one! I have yet to find the "perfect" knitting bag. I use different totes, depending on the project, and I have a small fabric bag that I use for my current sock-in-progress that is always in my purse. I just thank you for great comment! Iam better and mt cold is gone! If you listen to knitting podcast...I just post new blog.. It is BIG NEWS..Check it out!